Merqury Republic, organizers of the annual Ghana DJ Awards have billed Okyeame Kwame, Keche, Shatta Wale, Stonebwoy, Edem, VIP, Mz Vee and other musicians to perform at the second edition of the award ceremony. This year’s edition of the awards will also see top DJs like DJ Mensah, DJ Slim, Dj Bright, DJ Mic Smith, Dj Jimmy Jatt from Nigeria, Dj Divalish from South Africa and other top DJs who show off their skills at the event. Organizers of the show have promised other surprising packages on the night when DJs, both local and international will be appreciated for their talents and hardwork. 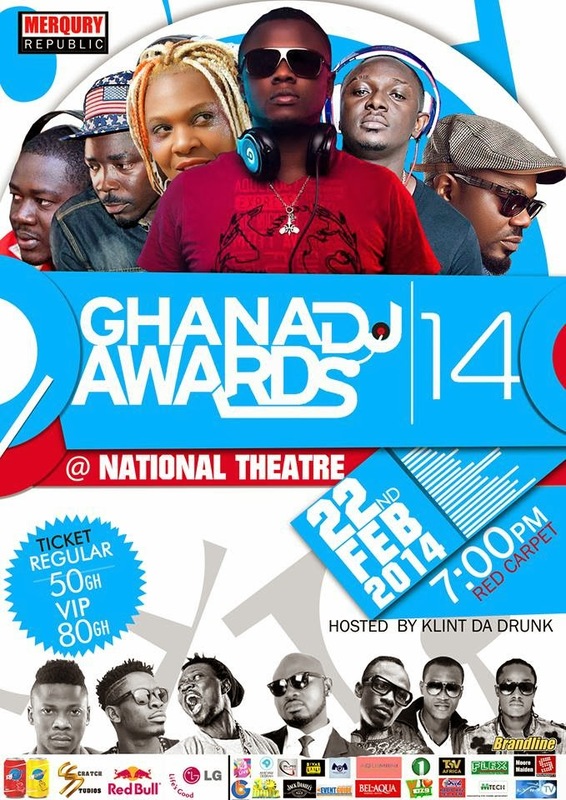 Ghana DJ Awards 2014 comes off on Saturday February 22 at the National Theater. The 2nd edition of the awards will be hosted by Nigerian comedian Klint Da Drunk. Tickets for Ghana DJ Awards 2014 are sold at Gh50 and Gh80 for regular and VIP respectively. can't wait to see shatta wale performs live.